In the 1950s, just a few years after gaining permission from Rome to form an independent community, now known as Annunciation Monastery, the Sisters asked world-renowned architect Marcel Breuer if he would design their first home. 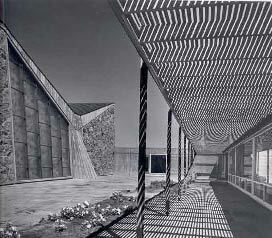 To their delight, Breuer accepted and designed what he called, "A jewel on the prairie." This expansive building made of stone and exquisite concrete shapes is well-known for its architectural beauty. 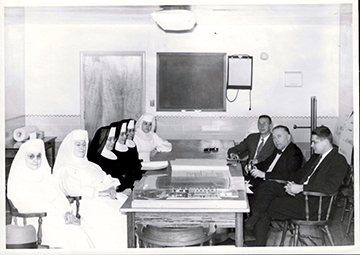 The sisters enjoyed the time they had meeting with architects Marcel Breuer and Hamilton Smith. The 100 foot bell banner, our community's trademark, under construction in 1962. 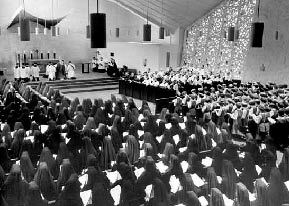 Sisters, students from Priory High and Mary College gather with Bishop Hacker and diocesan clergy in the newly constructed Our Lady of the Annunciation Chapel during its dedication May 13, 1963. Characteristic of Breuer's work is the play of light and shadow. When we built our new monastery in 1999, we incorporated Breuer's design, because it has influenced us as a community. Jesus said, "A city on a hill cannot be hidden." It has been a Benedictine tradition to build on mountaintops and high places, and to become a beacon of light for the people of God in the region. Also part of the tradition has been the building of monastic structures beautiful and worthy to house the light that is radiated in mission and leadership. 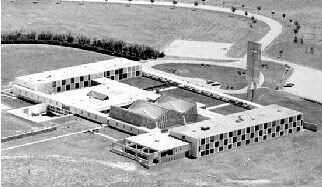 This hilltop monastery and University campus in Bismarck, North Dakota, is true to that tradition in the care that the Sisters gave to locating a lofty and beautiful site and choosing, with daring leadership, a great architect who could design buildings that would become art treasures for the nation and world. We celebrate, in this place, the shining jewel he created, from which we reflect beams of God's light to the region, the nation and to all parts of the world to which the Sisters, University of Mary graduates and faculty go to serve. Let us think about these buildings as visible parables of Benedictine tradition, mission and values, as indeed Marcel Breuer very thoughtfully intended they would be. While there are very many Benedictine values drawn ultimately from Jesus' gospel, there are six beams of that light through which the University of Mary prefers to shine: community, hospitality, respect for all persons, service, moderation and prayer. Community and hospitality are invited and supported through generous gathering spaces where hospitality can be offered graciously, people can meet and mingle, where large spaces flow uninterruptedly into smaller, more intimate spaces. Respect for persons is encouraged by simplicity of form and limited areas of color. Breuer believed that people should be able to give life, color and character to the spaces, rather than impose a designer's taste on everyone. The predominance of white walls and natural tones of brick and wood accommodate the dweller's own treasures and tastes. Service can be offered in many ways in spaces that can be reconfigured to new specific services, or that can serve in multiple ways. Moderation is a characteristic that strikes many people immediately upon entering these buildings. To a consumerist, accumulating society, they may seem at first start, but for those who linger, the simplicity of having around only what functions and serves begins to feel refreshing, freeing and serene. Soon it is the rest of human environments that begin to feel crowded and excessive, and one finds that simplicity feeds the soul. This simplicity also highlights the priority of prayer and the spiritual. The buildings have an aura of peacefulness, serenity and focus that seems to override all of the busy-ness of everything that goes on within their walls. Breuer's skill at framing and utilizing nature keeps one connected to the mysteries of nature, the passing of time and season. Light and shadow play silent dramas, creating constantly changing patterns each hour and season. The remembrance of sacramental holiness is awakened in the chapel font, the bell banner announcing the hours of monastic prayer and Sunday worship. Like a beacon on this hill, the bell banner soars into the sky, to be seen far and wide, while its unseen roots are buried deep in the earth. We remain true to its rootedness in the Christian, Catholic, Benedictine tradition with our mission centered in gospel values. From this hilltop, you too are invited, with us, to carry the light far and wide.